Last Friday we took a look at an unusually cute trio of trilobites. Of course, trilobites are a pretty broad group. The species name of these specimens is Anataphrus vigilans. These particular trilobites hail from the Upper Ordovician. While trilobites make popular fossils for home collectors, this species is rarely available for sale. Specimens are somewhat scarce and when they are found, they are almost always rolled up in defensive positions. These poor trilobites were taken by surprise. They have been really beautifully preserved in a natural setting. Trilobites were an incredibly diverse group of animals that were common in the ocean for about 270 million years. They filled many ecological niches. Some foraged on the seabed, while others swam freely in the water. The fossil record establishes various species of trilobites as predators, filter-feeders, and scavengers. While the trilobites in this week’s picture were a manageable five centimeters long, there was a great deal of diversity of both size and structure in this group of organisms. The largest trilobite fossil that has been found so far is over seventy centimeters long; quite large by the standard of any arthropod. The winning reader this week? A fair number of you emailed me on Friday—I'm so sorry comments were inadvertently closed. We won't screw that up again! And of course, everybody knew these fossils were trilobites, but, sadly, nobody got the genus right. Accordingly, I'm calling the win for GrizzlyD, due to persistence! Congratulations, and thanks for playing! If you have a fossil you want to share, send your pictures to me at schoerning at ncse.com. 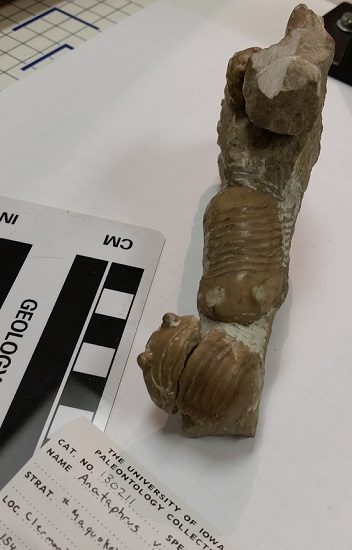 And if you need another fossil fix, check out the UIowa Palentology Repository, who we thank for this week's fossil!